Born in Kenya on the 4th June 1934, she grew up amongst animals, both wild and domestic. She was educated at Nakuru Primary School and the Kenya High School where she matriculated in 1950 with Honours and the possibility of a bursary for University Entrance in the Cambridge School Leaving Certificate, achieving the position of 8th in the Colony. Instead Daphne opted for marriage. Living as she did within a National Park, she had the opportunity to observe and study most species at both the field level and in a captive situation. Rearing their orphaned young has brought to her a unique and unparalleled understanding of the "inside story" of wild creatures. - knowledge of their minds and emotions, the role of instinct where it impacts on behaviour, the importance of scent and chemistry in their daily lives, telepathic capabilities, individuality, vocalizations, and the ability to interpret the subtleties of a complex body language. For over 25 years, from 1955 until 1976, Daphne Sheldrick lived and worked alongside her late husband, David, the famous founder Warden of Kenya's giant Tsavo National Park. During that time she raised and rehabilitated back into the wild community orphans of misfortune from many different wild species, including Elephants aged two and upwards; Black Rhinos, Buffaloes, Zebra, Eland, Kudu, Impala, Duikers, Reedbuck, Dikdiks, Warthogs and many smaller animals such as civets, mongooses and birds. She is a recognized International authority on the rearing of wild creatures and is the first person to have perfected the milk formula and necessary husbandry for both infant milk dependent Elephants and Rhinos. The key to her success has been her life-long experience of wild creatures, an in-depth knowledge of animal psychology, the behavioral characteristics of the different species, and, of course, that most essential component, a sincere and deep empathy. For her work in this field Daphne Sheldrick was decorated by the Queen in 1989 with an M.B.E., elevated to U.N.E.P.’s elite Global 500 Roll of Honour in 1992, among the first 500 people worldwide to have been accorded this particular honour, and awarded an Honorary Doctorate in Veterinary Medicine and Surgery by Glasgow University in June 2000. In December 2001 her work was honoured by the Kenya Government through a prestigious decoration - a Moran of the Burning Spear (M.B.S. ), and in 2002 by the B.B.C. when she received their Lifetime Achievement Award. In the November 2005 issue of the Smithsonian Magazine Daphne Sheldrick was named as one of 35 people worldwide who have made a difference in terms of animal husbandry and wildlife conservation. In the 2006 New Year’s Honours List, Queen Elizabeth II appointed Dr. Daphne Sheldrick to Dame Commander of the Most Excellent Order of the British Empire, the first Knighthood to be awarded in Kenya since the country received Independence in 1963. Since the death of her husband in 1977, she has lived and worked in the Nairobi National Park, courtesy of the Kenya Government, her home duplicating as the Orphans' Nursery. It is here that she has successfully hand-reared over 70 newborn Elephant orphans, some from just hours old, the first time this has ever been achieved. Having completed their two milk dependent years, these orphans, along with the human family of Keepers who replace the lost elephant family, grow up in the Tsavo National Park, where they mingle freely and at will with the wild herds and eventually become fully integrated back into the wild community. Some of Daphne's orphans have now had wild born young, which they have brought back to show their human family. Daphne has also successfully raised and rehabilitated over a dozen Black Rhino orphans from newborn, some of whom have had wild born young which they have shared with their human friends. Her expertise has been instrumental in helping many other elephants Africa wide, South Africa, Zimbabwe, Namibia, Zambia, Burkina Faso, Uganda and Cameroon to name a few as well as elephants in India, Thailand, and Siri Lanka. 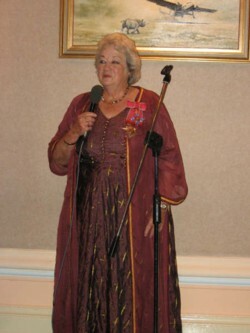 Daphne Sheldrick has tirelessly campaigned at an International level against the abuse of captive animals, most notably in securing the freedom of some of the Tuli elephant calves kidnapped from their living families in Botswana which were being subjected to brutal "training" in South Africa. Daphne Sheldrick is recognized internationally as probably the world authority on both the African Elephant and the Black Rhinoceros, with a broad knowledge of Natural History and the interlocking role of different species within the environment. Through four books, numerous articles, lectures and television appearances, she has promoted wildlife conservation worldwide. The BBC Documentary "Elephant Diaries" depicting her work with the orphaned elephants, filmed over a period of a full year, has received world-wide acclaim, attracting a viewership of 6 million in England alone for the five evenings it was shown on BBC 1. The series will now go to America on the Animal Planet channel and thereafter world wide. Through the David Sheldrick Wildlife Trust, established after the death of her husband in 1977 in his memory, she has made a further significant contribution to wildlife conservation in Kenya, supporting the Kenya Wildlife Service by meeting contingency needs during times of economic constraint; funding fuel for anti-poaching forces, de-snaring Park boundaries and mobilizing a fully equipped Mobile Veterinary Unit to deal with the sick and wounded in the Tsavo ecosystem as well as Amboseli, the Shimba Hills and Chuyulu National Parks promptly and unobtrusively responding whenever possible, just as David would have wished. "The most important thing people can do to save elephants from extinction is NEVER buy ivory; shun it entirely,.....An all-out ban on ivory trading is essential. Everyone can live without ivory, but not an animal that duplicates us in life span and intelligence."